I have approached this recipe in what some might consider a rather unusual way. The important point is the ratio between the egg, sugar and flour. Since egg sizes differ, the surest way to make sure you get the right ratio is weigh your eggs first (cracked or uncracked - the shells don't weigh enough to make a big difference) and then measure out your flour and sugar accordingly. Whenever I have a recipe that uses mirin, someone invariably asks whether it can be omitted or substituted for. In this case, there really is no substitute. The combination of mirin and soy sauce gives the doroyaki pancake its distinct dark brown color, umami and slight saltiness. If you can't use mirin for whatever reason, just leave it out. filling of your choice, such as Not So Sweet Tsubuan (sweet azuki bean paste). Measure the weight of the eggs with your scale. Note down that number. Set aside. Measure out the same weight as the eggs in sugar in another container. For instance if your eggs weigh 100 grams, measure out 100 grams of sugar. (For ounces people: if your eggs weigh 3.5 oz, weight out 3.5 oz of sugar.) Set aside. Measure out the same weight as the eggs plus 50% in flour. For instance if your eggs weighed 100 grams in total,, measure out 150 grams of flour. (For ounces people: if your eggs weigh 3.5 ounces, measure out 5.25 ounces of flour.) Add the baking soda to the flour and mix with a fork or your still-dry whisk. Set aside. Crack the eggs into your mixing bowl and mix with the whisk until the eggs are broken up but not too frothy. Add the sugar, honey, mirin, soy sauce and the 1 tablespoon of oil, and mix well until the sugar has melted and there are no lumps. Add half of the flour-baking soda mixture; mix well until the flour is amalgamated. Add the rest of the flour slowly. Point: Don't over-mix or the pancakes will be a bit tough. When you are ready to cook the pancakes, heat up a non-stick frying pan or crepe pan over medium-low heat. Lay the moistened kitchen towel next to your cooker. When the pan is hot, drizzle a little oil in it, and spread it around with a wadded up piece of kitchen towel. (I use wooden chopsticks to hold the kitchen towel.) The surface of the pan or griddle should only be just lightly coated with oil. If the pan gets too hot (if it stars smoking, or your first pancake gets burned) take it off the heat and put the hot bottom for a second on the moistened kitchen towel to cool it down. Pour the pancake batter on the griddle to your desired size. (For a 4.5 inch /12cm dorayaki it's about 2 tablespoons.) Let it cook without turning until tha pancake is cooked through; the top surface should be nearly dry. (If you turn it too fast the bottom surface will be mottled rather than an even brown.) Turn over and cook on the other side for a few seconds while pressing down lightly. Remove from the pan with a spatula. Let the pancakes cool before filling. When filling, put the nice dark brown side on the outside and the pale side on the inside. Put about a tablespoon of filling in the center of one pancake, press the second pancake on top and press very lightly to form a nicely rounded sandwich. The dorayaki pancakes can be frozen quite successfully, and will keep for a couple of months well wrapped. I prefer to freeze the pancakes before filling them, although some people freeze the whole filled dorayaki. 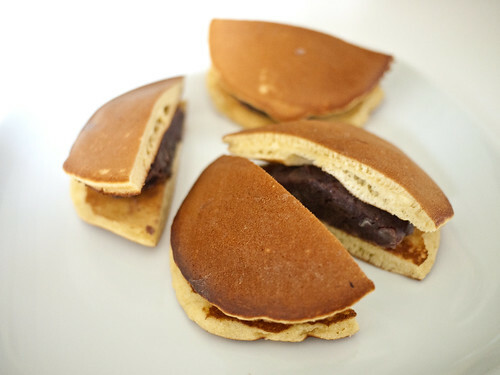 The traditional dorayaki filling is tsubuan or sweet azuki bean paste. See Not So Sweet Tsubuan (sweet azuki bean paste). Cream dorayaki is filled with a mixture of half tsubuan and half whipped cream. Butter doroyaki is filled with tsubutan and a pat of salted butter. It's nice if the pancake is warmed up before making the sandwich, so the butter melts while you're eating the dorayaki. Ichigo dorayaki is filled with tsubuan and a sliced strawberry. If you like ichigo daifuku you'll love this. A small bit of whipped cream can be added too. Try filling a dorayaki with a small scoop of vanilla ice cream, with or without the additional of a teaspoon of tsubuan. If you have some saikyo miso (see Miso Basics try mixing it in a 2:1 ratio with honey, and spreading it sparingly between the pancakes. Not at all traditional but very yummy. Caramel sauce, spread very thinly, is a great (and non-traditional) filling too, perhaps with some sliced strawberries. ...and whatever other fillings you can imagine! Dorayaki pancakes are quite tasty plain too; just warm up for a minute in a dry frying pan, or in a toaster overn. 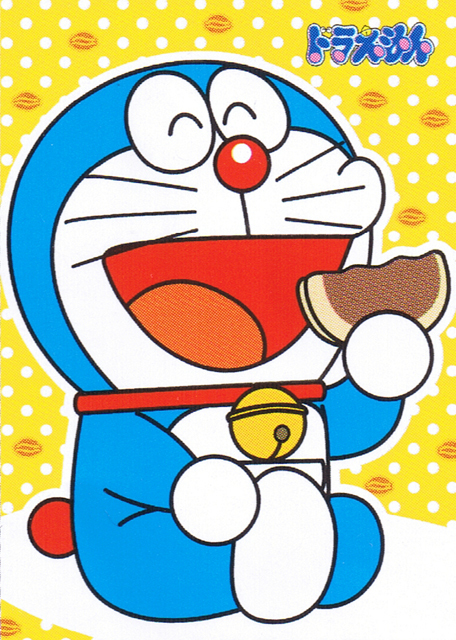 Bonus: Doraemon enjoying a dorayaki. If you're unfamiliar with Doraemon, read more about him on Wikipedia. There are also a lot of Doraemon clips on YouTube. Doraemon is played by French movie star Jean Reno in a series of live-action commercials for Toyota in Japan. Yeah, I don't get it either. But they are funny in a surreal way. Submitted by maki on 2013-01-08 15:48. I must try and make this. I keep hearing how delicious it is! OH MY. This is perfect. Doraemon is the childhood hero of my Sicilian partner (yeah, I don't get it either). You have just made one man very very happy. ...And as a loosely Francophone Belgian, I can say it is really, really weird to see Jean Reno like that. How's his accent?! Could you use this same batter to make taiyaki (I have a mold) or is taiyaki batter different? Thanks for the great recipe? Taiyaki batter is a bit lighter, so what you could do is take out one egg white from the 2 eggs, whip it until it's stiff, then fold it back in to the batter you make with the rest of the egg + other ingredients. How do you think lemon curd would work? I was given a couple of fresh lemons from a friend's tree in Florida, and I don't know what to do with them, but was thinking of lemon curd... just not sure what to put the curd on. I think (although I have not tried it) you can substitute a gluten-free flour such as rice flour that's finely ground for baking purposes instead of the wheat flour. You may need to adjust the amounts, but since pancakes (and these are after all just a form of pancakes) do not need the gluten of flour for its texture, it should work fine. You may want to try Gluten-Free Goddess's pancake recipe as a guide - I have only heard rave reviews of her recipes. Gluten Free Goddess pancake recipe. If your gluten allergy is very sensitive you'll also want to use a gluten-free soy sauce. Thanks for posting the recipe, Maki! I'll definitely try it! Jean Reno as Doraemon!! Hilarious! Doraemon was one of the first manga to enter Indonesia, back in the 1980s, and I would religiously buy the comic books and devour them. My absolute favourite chapter is the one where I found out how Doraemon lost its cat ears to robotic mice!! Before then, I didn't even know that Doraemon is a cat robot, just a funny looking round shaped blue robot with whiskers. Do you think chestnut jam would work? Just as it is one of my favourite stuff and texture and colour are a bit an-like.. It could be a bit too sweet, but certainly worth a try. Maybe mix it with some unsweetened chestnut paste or whipped cream to cut down on the sugar. Thank you for the recipe! I would like to make these but I do not own a food scale. Is there another way to know how much sugar and flour one should add to the eggs? I will make one soon I think! Unsweetened chestnuts paste sounds like a good idea....I'm not a big fan of whipped cream in any shape and form. This image of "Doremon" made my nephew hungry..had to rush near by market to bring something for him to eat. This looks amazing. A great idea. Please check out the food blog I have just started www.surreyKitchen.wordpress.com. Thanks! Great recipe! It do not look so hard, I think I will venture to do it using the mirin and the original pancakes recipe(not the instant pancake mix). Thank you for posting this. It worked perfectly and now my two kids are asking to make them every weekend. I can remember making these for my Japanese class in high school way back in the 80's for extra credit. It was next to impossible to find sweet bean paste where I lived back then. I ended up substituting prune purée which was easy to find in any of the Italian grocers in town. MMm, what a yummy snack! How are you? I have been following your blog for a while. I am a pastry chef and I am trying to get a really good book on wagashi (I don't mind if it's in Japanese). I did a search on Amazon Japan and was totally overwhelmed by the selection of books they have on the subject. I don't really like buying books out of the blue (especially with those prices!) so I wanted to know if there is one you recommend or you might think it's better than the others. I am particularly taken with Hidemi Sugino's books but I think his books are on patisserie and desserts in general not just wagashi. I really hope you can help. Congratulations on your beautiful blog!